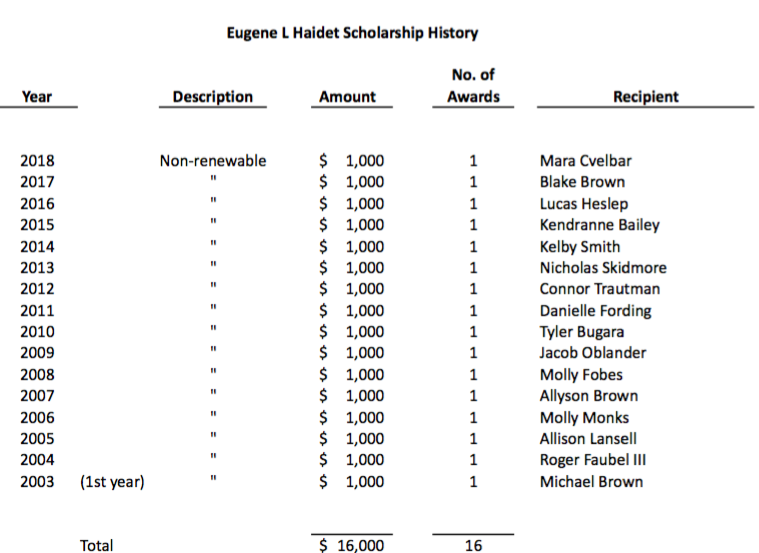 When Eugene (Gene) Haidet ‘38, a twelve year treasurer of the AHS Foundation, passed away in 2002, his children fittingly memorialized his life with a scholarship in his name through the foundation that he so ably served. Mark ’72 and Kathryn Haidet, Michael ’73 and Susan Haidet, and Barbara Haidet Verbus ’77 and her husband Gregory ’77 made the initial gift of $10,000 to establish the scholarship. They have continued to contribute annually. Gene Haidet was the valedictorian of the AHS Class of ’38 and a 1942 graduate of Mount Union College, with a degree in Business Administration. He and his spouse, Janet Kolp Haidet from Canton, had been married for 53 years at the time of his death. He was a 47 year employee of Paul A. Kintz Construction Company where he served as Secretary-Treasurer. Gene’s commitment to AHS and the Alliance community was extraordinary. He was an 18 year member of the AHS Distinguished Alumni Selection Committee, serving as its publicity chairman. As a 43 year member of the Kiwanis Club, he was the treasurer for 29 years and a past president, as well as a lifetime member of Kiwanis International. He was a member of the United Way Board for 7 years, serving as campaign chairman and president. Additionally, Gene was past president of the Alliance Visiting Nurses Association Board, a Chamber of Commerce board member, a member of the Parish Council of Regina Coeli, and volunteer with the Len Dawson Celebrity Golf Classic, which helped fund the Mel Knowlton Scholarship. Gene’s service was not just on the local level. As a U.S. Navy veteran, he served 4 years on a destroyer in the Pacific and remained in the reserves after the war. He was called up for two years of active duty during the Korean War and eventually retired as a Lieutenant Commander, with 20 years of reserve service. Gene was truly a servant of his high school, his home town and his country.